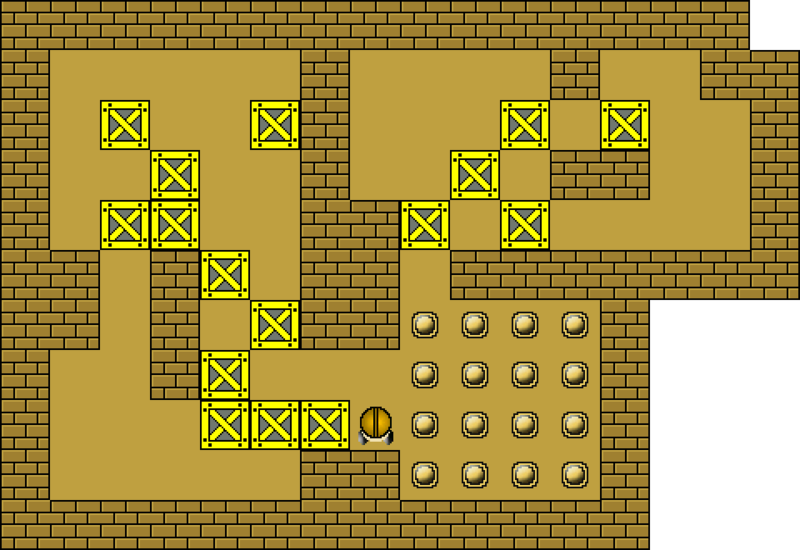 Many of the Original Extra levels 51-90 are very simple. 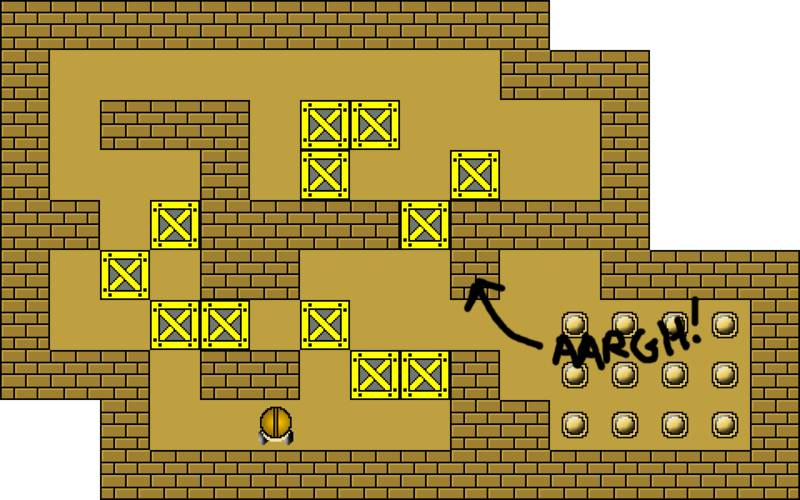 Vast amounts of unneeded floors and levels made so the maze area and the goal area can be solved virtually independent of each other. 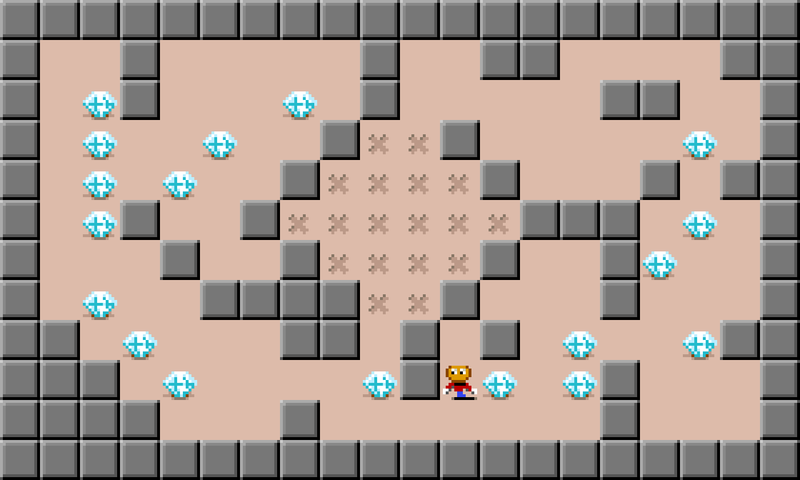 Probably many of the levels were made for testing Sokoban with a computer and just by coincidence were published as a collection. Just my guess. These levels crave for changes. In his Fourth Set Howard Abeds sharpened some of the levels in the Original and the Extra collections. Howard added extra boxes and removed floors. He never added floors and very seldom changed the original layout of the boxes. You will find a renumbered and commented version of the collection in Sokoban.dk’s download section. Eric F. Tchong made the collection “Original 51-90 Remodeled”. These levels are often extensively expanded remodels of the levels. Many more authors made sharpened or remodeled versions of the collection. Some good. Some bad. I decided the Original Extra Collection needed another rework. Generally the levels are modified by sharpening and reducing the size while keeping the main layout intact. Stuff are never added to make the levels bigger but there might be space for a box or two more even inside drastically reduced levels. I prefer to name these changes “Sharpening” instead of “Remodeling”. Sometimes I didn’t stone a floor or add a box even if it was possible. This is on purpose. Stoning everything might ruin symmetry and the look of the puzzle. Adding boxes inside the goal area are not interesting if the only thing you have to do is push the box to its final position. If you feel I have forgotten something or you have a better reduction don’t hesitate to tell me. If I agree I will present it here. These levels are of moderate difficulty. Nicely designed. No sensible sharpening or reduction. Just pushing the boxes directly to their goal one after another isn’t much of a challenge. But no more is required to solve the original level 53X. Vast possibilities for improvement. The lower right part of the level has no purpose. The shape of the goal has no significant influence on the solution and I really don’t like dead ends for final goals. So I made the goal a nice rectangular one and stoned lots of floors lower right. And further stoning centrally and to the right. The width was reduced by one column. By moving the box at H3 to G3 and the box at G10 to G9 it was possible to reduce the level further one row and one column making the solution a little more interesting and difficult. No, I didn’t remove anything outside the goal area. Just added walls. Check it if you don’t believe me. A nice level that just had a lot of unnecessary floors. 25 to be exact. The central part of this level is at copy of Original 50 reduced from 16 boxes to 12. Implemented in a bad way with an extra pathway bottom middle changing the complexity of the solution towards zero. I closed this and reduced the floors by 50! Neither YASS, Takaken, JSoko or Sokolution managed to solve the reduced level. I tried to check for other reused layouts in 51X-90X but wasn’t able to find any. Tell me if you find some. I stoned the obviously unneeded floors and normalized the level. 6 more floors needed some thinking before I realized they could be stoned. The obvious reduction is to move the right part of the level 2 columns to the left. To keep the layout and keep the boxes at K3 and K10 moving I had to remove the marked walls. For the finish I did a little stoning limiting the number of possible solutions. Added 4 boxes and modified the goal area accordingly needing no acces from the bottom neither before nor after the modification. I added a wall at Q5 and moved the box at R7 one step left to be able to reduce the level with one column. Same size. Looks much the same. But different solutions. 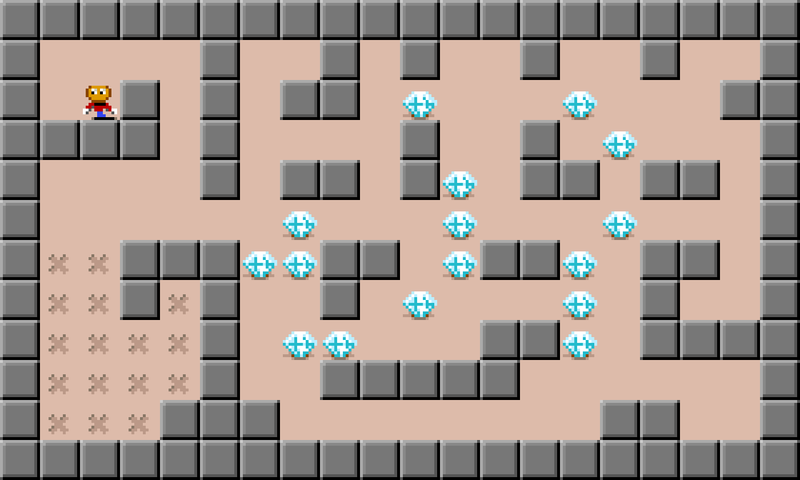 In the original level you can just solve the left side and then the right. With a wall at B7 you need to solve the right side first so you get the passage at the top free since you need acces to both sides of the boxes at the left side to solve them. Lovely. Whether Original or Reduced neither YASS nor Sokolution had any problem solving the levels. I like my goals nice and symmetrical if it is an easy access (As is the case in most of the levels 51X-90X). So I added a box and a goal by removing a wall. As a compensation for this enormity I blocked the acces for boxes from the bottom. Then just stoned whatever floors possible and normalized the level. This level actually is laid out nicely. Looks like you can easily place an extra box on the left side. Well, you can’t. But upper right and in the middle in the crowd I placed two more boxes and changed the cross to a mushroom. Might do some stoning but it will not change the gameplay. The channel from the goal area to the right has no other purpose than moving a single box. Anyway I kept it. And did the traditional stuff: Reduced the level with one column and reduced the floors from 140 to 111. The obvious reduction with two columns. Some interesting stoning at E10, M6 and S9. Only E10 really changes how the level is solved. The rest is purely cosmetic. 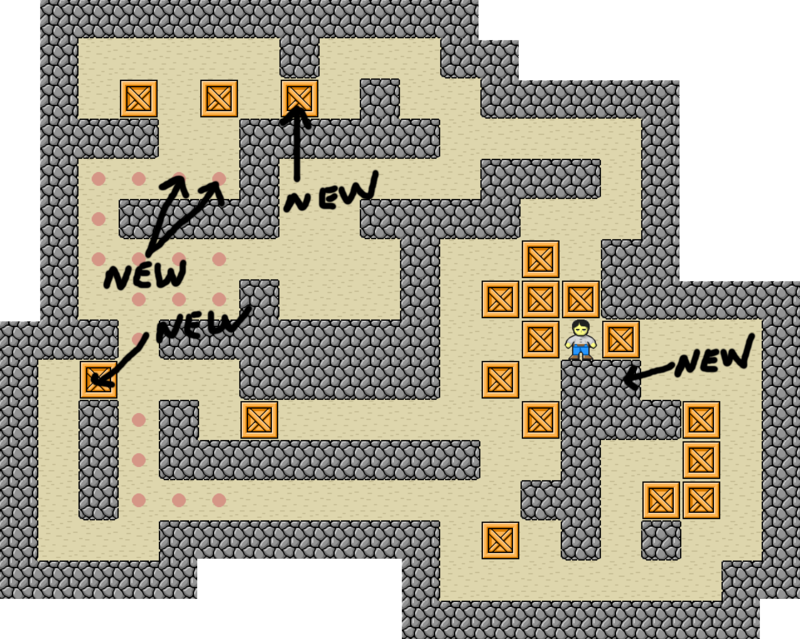 What alters the solution for this level to something slightly interesting is the marked changes. The rest is just cosmetic stoning of unnecessary floors. Added 3 boxes by the way. Tried the solvers Sokolution and YASS with this level. Both succeded but Sokolution needed 16-24 seconds and YASS just a fraction of a second. I have no knowledge of how the solvers work but I suspect this is a level where intelligent solving is better than brute force. 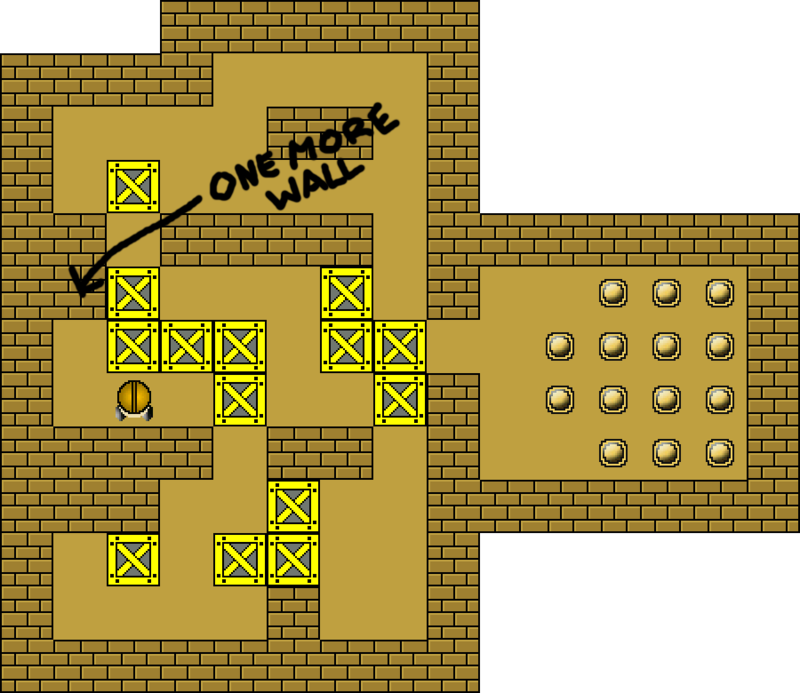 The wall at L10 makes the solution around 50 moves longer. Simply the best level in the set! One extra wall at C5 increases my best solution from 1061 to 1309 and neither YASS nor Sokolution was able to solve the level. After the previous little gem it is back to the treadmill. Two extra boxes. One column less. Lots of stoned floors and close to the original solution. You need to be a little more organized with 4 floor less in the temporary storage area at the right. Stoned some dead ends but that is only tampering with the decoration. The Sokoban really has a long way to go to make the level 20×12 rectangular… I found room for two more boxes and changed the goal area for a little challenge and better look. More than 10 superfluous floors can be stoned but it really doesn’t change the solution. Nice actually. You need to get two boxes from the left side to the right side of the goal before you can fill in all of the 4 left boxes in the goal. The maze can’t be sharpened so I just added a few boxes. Added 5 boxes. Stoned some floors. And still got a not very interesting level. The floor at I8 is obviously of no use but was left for the lightness of the level. 2017-09-28: Another sharpening missed at the first publication. Archanfel added two boxes and stoned and moved the marked goals. Not strictly according to my sharpen rules but hey! No rules without exceptions. The level actually gets more fun to solve since now you have to arrange the left side before you can solve the right and still get access back left. I just made a few cosmetic changes to feel comfortable. If you want to reduce the width of a level by one column you need to have a spendable cell in every row. But they don’t need to be in the same column all of them. To do the trick here I moved one of the goals. 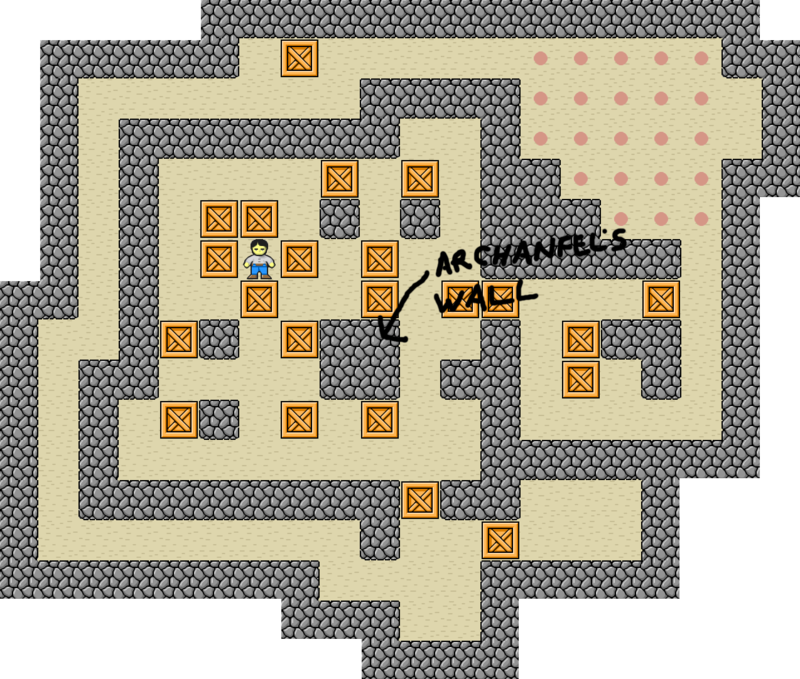 It really has no noteworthy influence on the solution and probably just got its original place to avoid double walls inside the level. 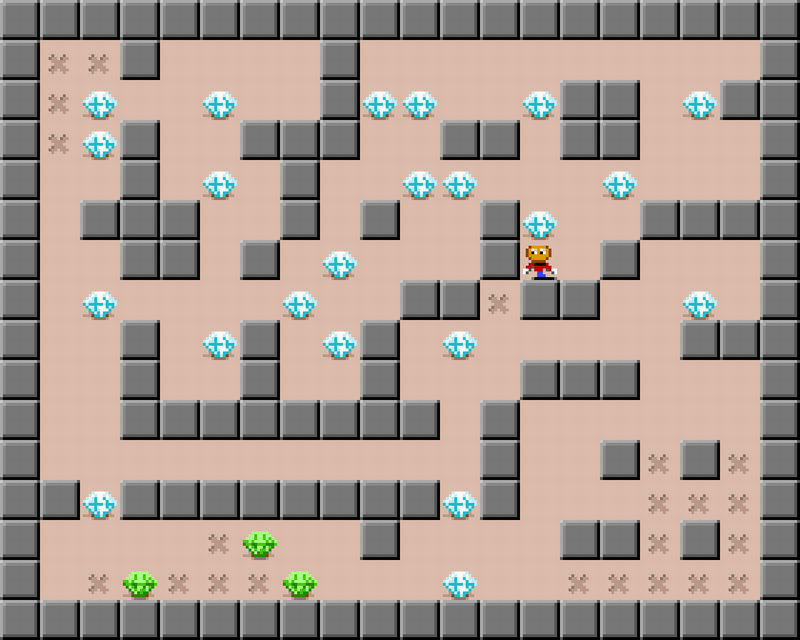 Stoned two floors and moved the level elements one step left as illustrated. And now no double walls without any tricks with dead end goals and floors to avoid it. Did some more stoning too. The solution? Pretty much the same. Stoning everything possible and making the goal square removing the dead ends it was possible to reduce the width by one column. The floor with access from all sides disappeared and now you have to push all boxes except one clockwise around the goal to reach it. Once again YASS used a fraction of a second to solve the level. Sokolution needed 12 seconds. I really don’t like dead ends. Usually you just push some box there and don’t have to worry about that any more. I rearranged the goal area a little removing two dead ends. This has hardly any influence on the gameplay and I was able to reduce the level by one column. Added an extra box by the way. The false level 77. An obvious easy reduction by 4 columns. Reshaping the goal area for a minimal increase in difficulty allowed an one row reduction. Another level where you can push the boxes directly to their final goal one after another. In the enhanced level you got one column less in the central area and the goal area and lower right area have been reduced. Now you have to switch box several times and need to place two boxes at specific places outside the goal before you can fill it. Oh, I forgot: You got two boxes more and 29 floors less. The old problems: The goal area is an enormous wasteland and generally the level can be tightened. The old enhancements: Turned the goal area and reduced it by 20 floors. Half the bottom row left isn’t needed. And the floor at B5 isn’t needed. Tighter but basically the same solution. 2017-09-09: Phew! I were the first one to spot this blunder. You dont need the floor at J6 to solve the level. It doesn’t take a genius to cut out 7×4 floors from the goal area. I inverted the goal and did some stoning too. When you have made a nice level have a look more. While typing this text I realized I could reduce the level by one more column. It is very much the same. Isn’t it? Just smaller. Everything is going forward so you don’t need the 3 floors to the left. Still room for 2 more boxes. The goal area is changed accordingly. The floors at J9 and K9 can be stoned but is left for symmetry. 2017-09-22: My first shot wasn’t good enough for this one either. Basically the same layout and gameplay.But within a smaller frame with three more boxes. Only change in gameplay is that you have to go backward top right. 4 boxes more. 9 floors less. Really not much improvement. At least you don’t have to look at all that empty space. I moved the box at D5 to C5 just to enjoy 4 boxes in a stack. No influence on gameplay except one more step to solve the level. 2017-09-09: In his collection number 4 Howard Abed made a better job by removing the top left 5 floors and adding 3 boxes. I moved the goal area further two rows left and found room for another box. 2017-09-26: I didn’t find sensible sharpenings or reductions. Well… I claimed that publishing this article. But one more box is possible here. Some cosmetic changes and reductions of unnecessary long passageways too. 2017-09-29: Archanfel keeps adding stuff. Two boxes more and a wall. But now I think the ultimate level is reached. I think this one will stand its ground as final. The main change is obviously the extra box. Reduced by one column too so you only need about 80 extra moves to solve the level. 2017-09-26: I totally missed this improvement found by Archanfel. 2017-09-19: Room for another box? Of course there is. Could place the extra goal top middle so it was necessary to use some of the unneeded floors top left but nicefied the goal area instead and removed the unneeded floors in the process. 2017-09-26: Room for another wall? Of course there is. Again Archanfel found an improvement missed by me. Funnily the best solution found by YASO are two moves shorter with the extra wall. Collecting all the goals except one at the bottom and stoning some floors are easy but there really is no point. The gameplay is the same. The best solutions for the Original Extra levels at Sokobano.de and LetsLogic.com are the same. 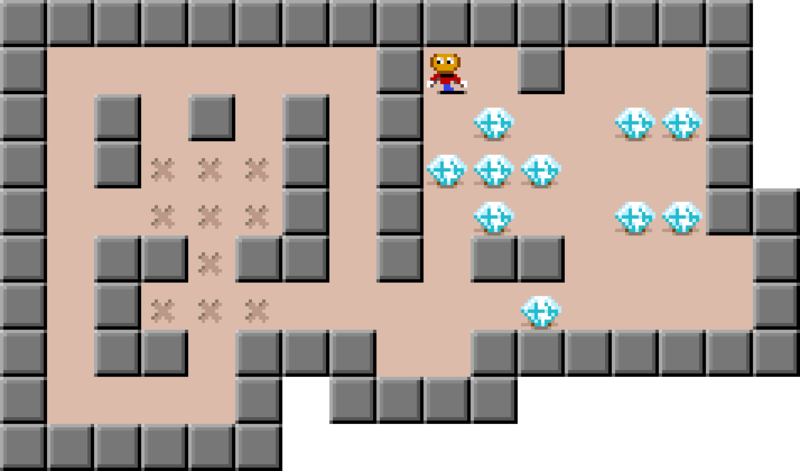 Only five Original Extra levels got a longer solution than the sharpened versions. The levels might be reduced but usually the complexity are higher. The biggest change in the length of the solution is 76X with a rise by 557 moves from 1017 to 1574 moves. 67X is my favorite level. Adding one wall changes the solution considerably. 76X is a close second. Again a single extra wall changes the solution in a big way. I didn’t test the new levels extensively with all noteworthy solvers (YASS, Sokolution, JSoko and Takaken) but surely the complexity of the levels have increased. Neither YASS or Sokolution managed to solve the new 66X, 67X, 69X, 72X, 87X or 89X. I love making levels the solvers don’t manage to solve. You can’t build on your million highscore just by autosolving and autooptimizing. You actually have to do some work yourself. (Yes. That can be agonizing 🙂 ). Suggestion for the highscore sites: A special category that only scores levels that can’t be autosolved. 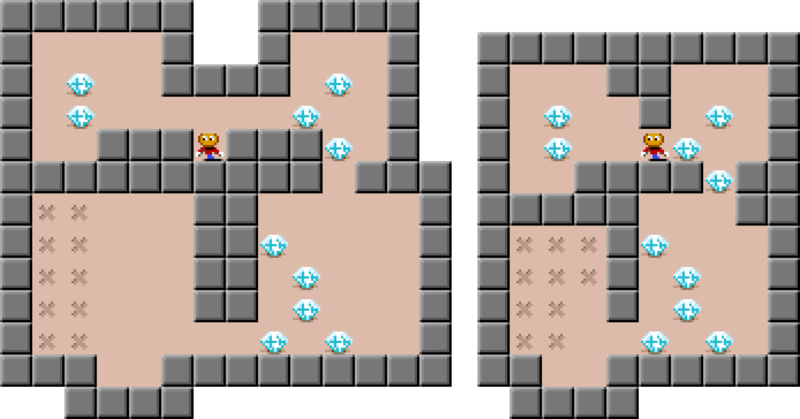 That would represent ability to solve Sokoban levels better. Best solutions below. The Sharpen results are just optimized by YASO so there surely are room for improvement. Of course you can download the collection. Just go to Sokoban.dk’s Level Download Page.